Gifted with that fixer-upper attitude? Love remodeling? Have a penchant for DIY projects? Then you’ve undoubtedly spent a decent amount of time (and money) at home improvement stores like Home Depot. You’ve probably wondered if their store-branded credit card is worth it. This review breaks down both personal cards Home Depot has to offer, from the benefits to the drawbacks and everything in between. Read on to find out if either of these cards is right for your wallet! Know Your Terms and Conditions: What is Deferred Interest? Why is This Card So Popular? What Does It Give Me? At first glance, these cards both look like typical credit cards, but you should be aware of some major differences. The Home Depot Consumer Credit card is a store-branded card issued by Citibank. Of the 2 cards offered, this one is more like a traditional credit card. However, you can only use it for purchases at Home Depot. The Home Depot Consumer Credit Card is geared toward individuals who make fairly regular medium-sized purchases and can benefit from special financing. Bottom Line: While any of these could certainly come in handy, they aren’t extraordinary perks by any means. One last perk that might be of interest: Citibank gives you the ability to see if you pre-qualify for this card without impacting your credit score. Not everyone has the funds to make large purchases outright. A lack of upfront funding is where special financing can come in handy. With the Home Depot Consumer Credit card, you have plenty of special financing options. 6 months everyday financing on purchases of $299+. But what happens if you don’t pay off your balance on time? Any time you take advantage of a special financing offer, you should be explicitly aware of the terms and conditions. There is a BIG difference between “no interest for 6 months” and “no interest if paid in full within 6 months.” The latter indicates you’ll be subject to deferred interest. In Home Depot’s case, almost all of their special financing offers have deferred interest. With deferred interest, if you pay off your purchase in full within the promotional period, no interest will be applied. 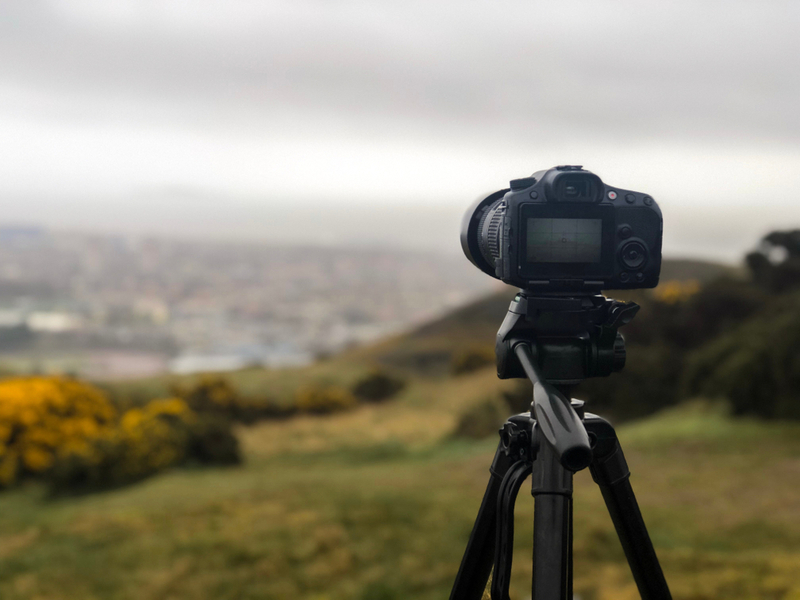 However (and it’s a big however), if you do not pay off your balance in full, interest charges will be imposed on the starting balance at the APR for regular purchases retroactively from the date of purchase. The regular purchase APR is the rate assigned to your account based on your creditworthiness. You can find it in your card agreement terms. Bottom Line: Charges can easily add up if you don’t pay off your balances on time, especially if you have many purchases that are being paid off under a deferred interest special financing promotion. Your balance can grow even faster if your assigned APR is on the high side. You can probably glean the purpose of the Home Depot Project Loan Card and who it’s geared towards from the name. Yes, this card is meant for individuals who are tackling a hefty project. The Home Depot Project Loan card is interesting because while it is technically a Mastercard, it is not a traditional credit card. Instead, this is a card you use to access funds from a consumer loan that has been extended to you by Home Depot Loan Services via GreenSky, LLC. You can only use the card at Home Depot and homedepot.com; it includes purchases via Home Depot’s Home Decorators Collection and Home Services. The Home Depot Project Loan card gives cardholders an extremely large line of credit (up to $55,000), 6 months to make purchases, and up to SEVEN YEARS to pay it all off. If you’re spending a sizeable amount of money on a large renovation, add-on, or new build, this offer can sound very enticing. It can have its benefits for the right user. Just make sure you know what you’re getting yourself into before choosing this card option. Cardholders use this little piece of plastic to access a line of credit or funds from a previously approved consumer loan. Your first step on the application is to request your loan amount, typically the amount you have estimated it will cost to complete your home project. The Home Depot Project Loan card allows for loans from $2,500 – $55,000. In general, it’s good practice to request only what you think you need. However, a budget for renovations can be difficult to determine at times. If you end up spending less than the credit limit assigned at loan approval, you’re only responsible for the amount spent during the 6-month purchasing window. The Home Depot Project Loan is an unsecured loan, meaning no collateral is required. Unsecured status is critical to consider because it means approval for the loan is based mainly on your credit score, your debt ratio, whether or not you own your home, why you need the loan, and potentially a few additional factors. If you request a massive credit line but don’t have the financial profile to back up the loan, it’s unlikely you’ll be approved. Once approved for the loan, you will have a 6-month purchasing window to buy items and supplies. Remember, this card is only available for purchases at Home Depot and homedepot.com and includes Home Depot’s Home Decorators Collection and Home Services. During these initial 6 months, cardholders are responsible for interest-only payments (at a minimum) based on the fixed 7.99% interest rate. After this period, the 84 months of fixed monthly payments begin. APR is where prospective cardholders should do some quick math before blindly hopping on board. What they don’t show in the table above is how much you’ll pay in interest over those 84 monthly payments. We’ve calculated a few of them for you in the table below. An important distinction: This total is the entire amount you would end up paying if you let the payments stretch out over the full 84 months (7 years). However, Home Depot does not apply a penalty for paying off your loan early. 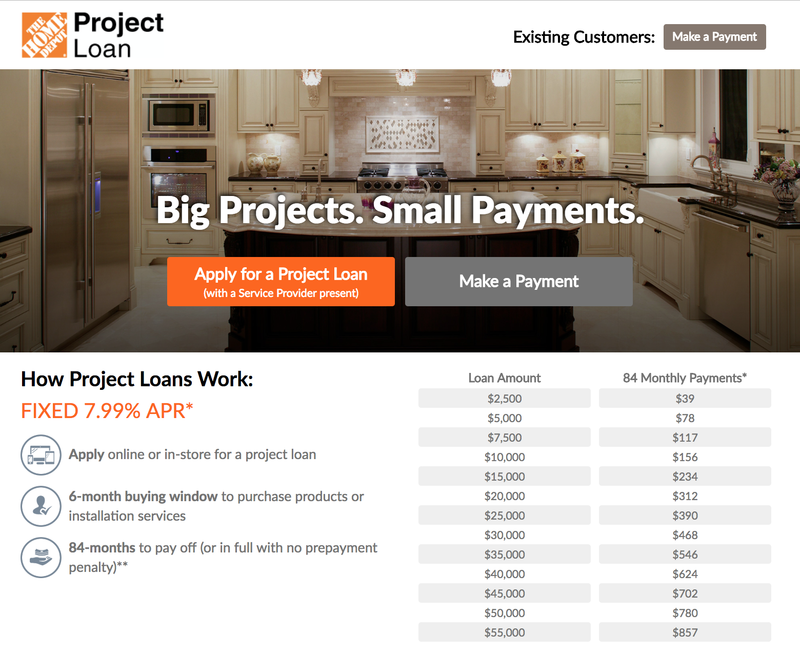 Bottom Line: If you’re fairly confident you can make more than the minimum payments each month or chip away at your balance with some extra payments over time to pay off your loan in full faster than the full 84-month repayment period, the Home Depot Project Loan Card could be a useful card. If you consider paying more than the original balance an unfortunate, yet unavoidable, premium necessary to get your project done, then the Home Depot Project Loan card could be worth it for you. We’ve discussed many of the fees and drawbacks associated with each card, but we’ll compare them here. Generally, you can easily access the terms and conditions for all credit cards. It was easy to find the terms and conditions for the Home Depot Consumer Credit Card. However, since the Home Depot Project Loan card isn’t a traditional credit card, the terms and conditions for the card are not easily accessible online and may not be available over the phone, either. Unfortunately, that means you can’t review all of the terms and conditions until you’re approved and review your loan approval paperwork. Hot Tip: The best way to avoid charges and fees is to be a responsible cardholder. Being a responsible cardholder means you pay off your balance in full each month. If you can’t pay it off in full (which is why you probably got a special financing card), pay as much as you can. At the very least, always pay the minimum amount on time. We won’t’ even get into what happens if you default on the Home Depot Project Loan. The average purchase price at a store like Home Depot is larger than at most other stores. Higher checkout amounts are one reason Home Depot offers solutions with affordable APRs. However, many rewards cards have 0% APR for up to 18 months which could be an attractive alternative, especially if you don’t need to spend tens of thousands of dollars (as that amount might require a higher credit limit). As you can imagine, there are more options — especially for those that can qualify for a credit card for good and excellent credit. Alternatively, if you’re into traveling then consider the wildly popular Chase Sapphire Preferred® Card which is arguably the travel rewards card on the market. The current sign up bonus is worth $625 when the points are used for travel expenses such as flights and hotel bookings through Chase’s travel portal. You will earn 1pt/$1 spent at Home Depot stores as well as 2pts/$1 spent on ALL dining and travel purchases. Customers can apply for either of the Home Depot cards in person at a Home Depot store or online. 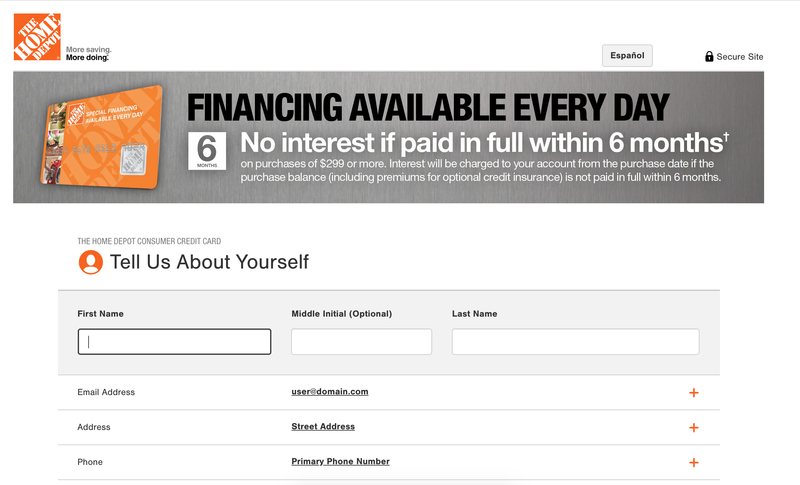 Home Depot Consumer Credit Card: If applying online, you’ll be redirected to a Citibank application page. 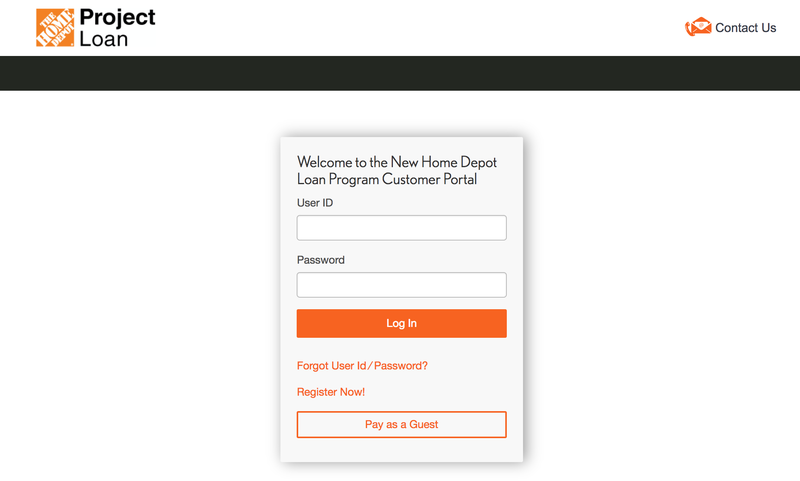 Home Depot Project Loan Card: If you’re applying online, you’ll be redirected to a THD Loan/GreenSky application page. Simply fill out the appropriate forms and submit your application. If you decide to apply in person, a Home Depot employee will assist you in submitting your application and walk you through any questions you may have. Home Depot Consumer Credit Card: Most credit card review sites report a fair credit score is needed to qualify for the card. 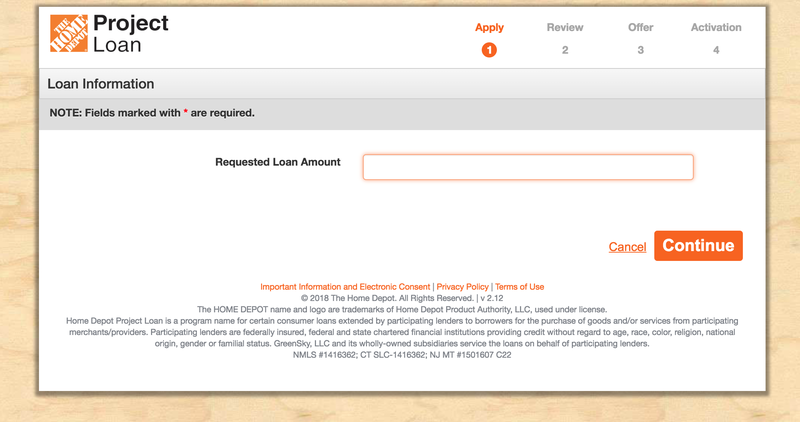 Home Depot Project Loan Card: Things are a bit more complicated with this card. While your credit score is a significant factor in this decision, it’s also possible the decision depends on other factors such as whether or not you own your home, your debt-to-income ratio, and the reason you need the loan (among other factors). However, the consensus from other card review sites is that you should have at least a fair credit score to consider applying. However, each application is unique. There are reports of denials for high credit scores and approvals for bottom-range fair scores. 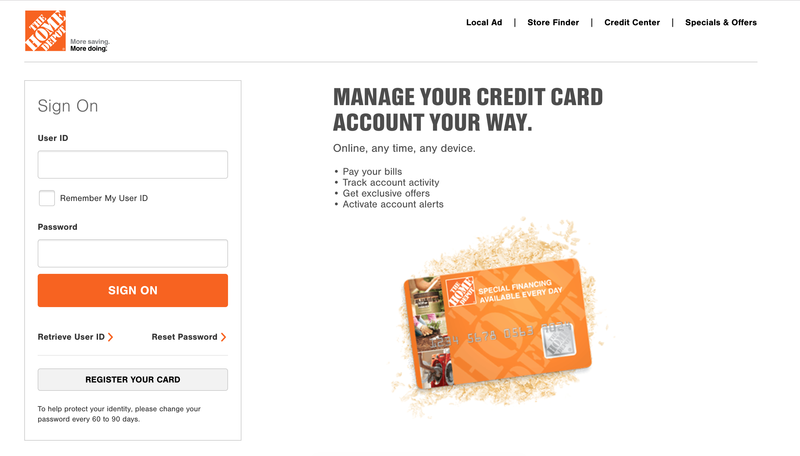 Home Depot Consumer Credit Card: Cardholders can manage their Home Depot Consumer Credit Card online through the portal provided. These cards each have their benefits and drawbacks. The Home Depot Consumer Credit Card might be a good card for you if you need special financing options for everyday home purchases. However, there are many other (more popular) cards out there that provides similar special financing and can give you rewards benefits at the same time. Remember, you can only use the Home Depot Consumer Credit Card at Home Depot, and you won’t earn any rewards for doing so. The Home Depot Project Loan card could be helpful if you’re completing a big project and don’t have the cash on hand to pay for everything up front. This card could potentially give you a credit line up to $55K. You’ll also get a 6-month purchasing window (during which you’ll only pay interest charges). After that, your payments are stretched out over 84 months at a fixed interest of 7.99%. That’s a pretty good interest rate if you’re extending payments for a little while, but if you’re planning to let them drag out over 84 months, you’ll end up paying much more than the original loan amount. Still, some may see this as a necessary hurdle to get the project accomplished. If you do choose this card, we recommend you pay off the loan as soon as possible to avoid hefty cumulative charges. Lastly, if you’re looking for a cash-back card or a travel rewards credit card to help you earn points or miles, this card isn’t for you. Featured image editorial credit: Niloo / Shutterstock.com. Which Home Depot Credit Card is Best? The answer to this completely depends on what you plan to use the card for. If you need to make general home purchases, you’re doing bits and pieces of DIY here and there, you just need a few new appliances over the next year or so, or you enjoy buying a decent amount of garden supplies, etc. then the Consumer Card from Home Depot is the better card for you. If you are undertaking a large project like a new build, home renovation or add-on, the Project Loan card is better suited for your spending plans. Who Issues or Services the Home Depot Credit Card? The Home Depot Consumer Card is issued by Citibank. The Home Depot Project Loan Card is essentially a card you use to access funds from your credit line issued by Home Depot Loan Services via GreenSky, LLC. Can Home Depot Credit Cards be Used Anywhere? No. Both Home Depot cards are limited to purchases from Home Depot or homedepot.com. This DOES include Home Depot’s Home Decorators Collection and Home Services. Does the Home Depot Credit Card Give a Discount? In short, no. The main benefit of the Home Depot Consumer Card is the possibility to utilize special financing options. Cardholders are not offered a standard discount or opportunity to earn rewards or cash-back by using the card. However, the more detailed answer is that there may be certain times throughout the year that Home Depot extends cardholders an offer for discounts on specific merchandise or for certain shopping dates. These offers are not guaranteed and are available for a limited time only. Does the Home Depot Credit Card Have an Annual Fee? No, neither of the Home Depot cards have an annual fee. 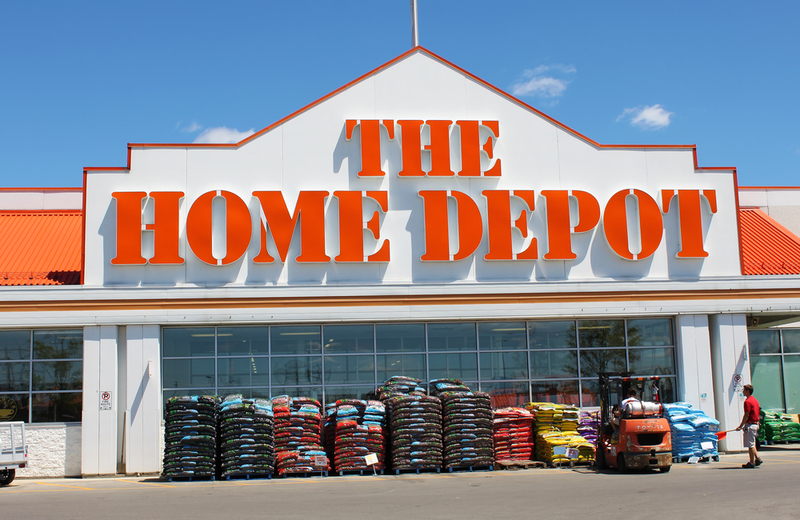 Can You Pay Off Your Home Depot Credit Card in Store? No, you cannot pay your Home Depot card balance in store. You can pay online, by phone, or by mail. This is the first time I get a credit card with free interest for 6 months and because is not paid in total by the 6 months the interest charges come back to your account to increase the balance. This is not fair for the customers. I want to advise people to not use this credit, if for some reason you can’t pay before the 6 months, they will make a lot of money from you. I will not use that credit card, I will not buy anything from Home Depot, from now on I will go to other store.